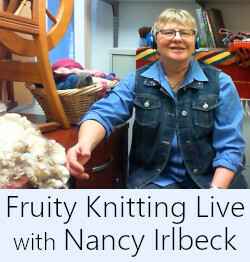 Carson Demers, author of the recently published book Knitting Comfortably, The Ergonomics of Handknitting, is our interview guest on Episode 31 of the Fruity Knitting Podcast. 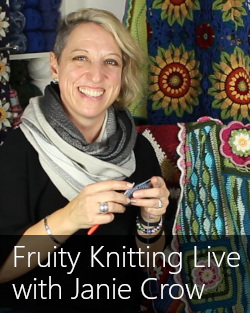 We travel to Helsinki, Finland, to meet Christa on Knitters of the World. 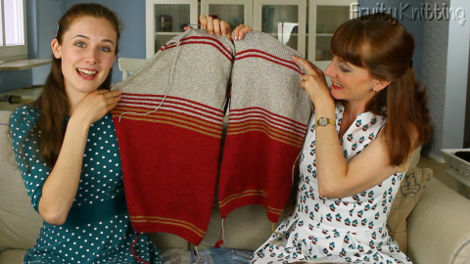 We get an update on Madeleine’s sweater and Andrew’s first Fair Isle project, there’s a sewing tutorial, and we’re meeting an old friend in a new segment! Enjoy. 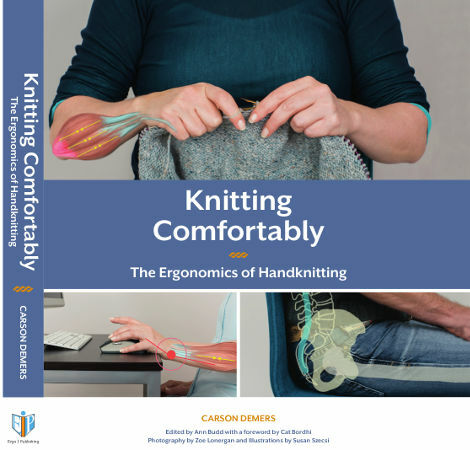 Andrea interviews Carson on his newly published book – Knitting Comfortably, The Ergonomics of Handknitting. 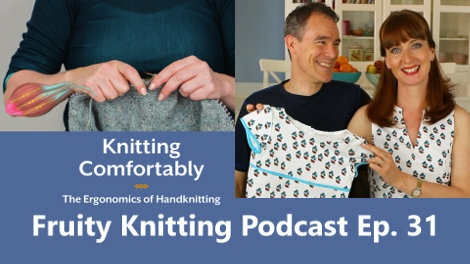 Understanding the ergonomics of knitting will help you knit more confidently, most probably improve your technique and make you more aware of how to avoid injuries. Carson is a passionate knitter and a trained physiotherapist. 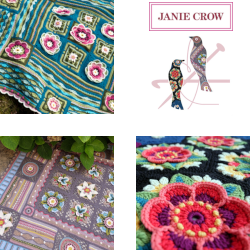 He has been on the receiving end of intense physiotherapy treatment and has worked with many knitters who have been injured so he is in the perfected position to be writing about this subject. The knitting world has really been waiting for this information to be presented in a cohesive knitterly language and Carson has now given it to us. In the interview Carson also mentioned the work of Dr John E Sarno, which looks at the mind’s influence of the body. Andrea stumbled across Dr Sarno’s work whilst researching her own problem. 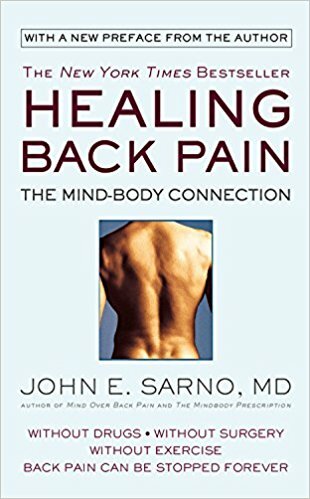 Although the title of the book refers to back pain, Dr Sarno’s approach has been used to successfully treat a wide variety of pain problems. It doesn’t apply to all conditions and is subject to some disagreement but is worth investigating if you have persistent or very debilitating pain. Andrea interviewed Shetland designer Donna Smith in Episode 14, and we then had the pleasure of meeting her in person at the Edinburgh Wool Festival, so we were very pleased to have her launch our new segment, New Releases. 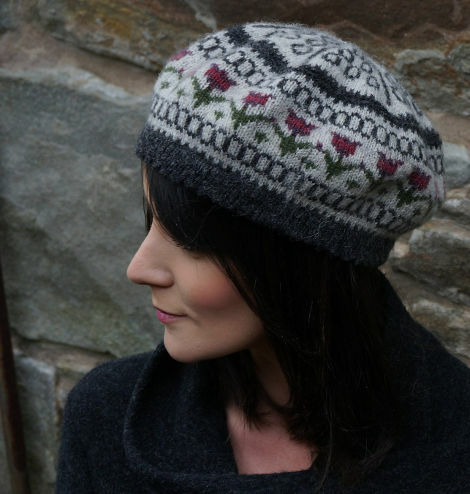 Donna introduced her Papil Beret, inspired by the pattern on a biscuit tin given as a gift by two visitors to Shetland Wool Week, and named after Papil in Shetland where they met. Donna showed us two different colorways, and Andrea is particularly taken with the light grey. I think it has been added to my apprenticeship syllabus. 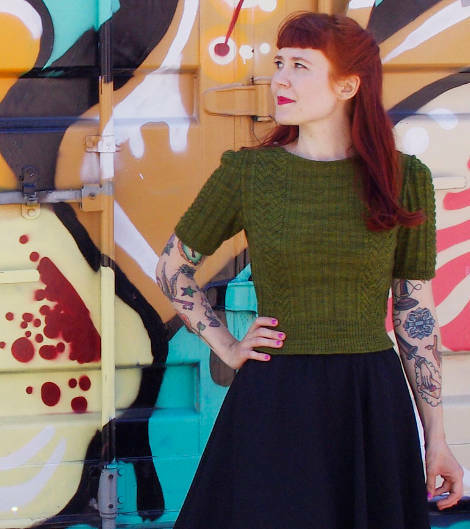 Christa started knitting around four years ago – a relatively late start – but seems to have skipped the basics and moved directly to the challenges of garment knitting. Persistence seems to play a part in her success – her projects names include “Repeat”, “2”, “Second Time Around” and “Finally”. Like some other younger knitters who have featured on the show, Christa’s tastes tend towards the vintage patterns. There are several Susan Crawford designs to be seen (but we were also touched to see Patons Australia make an appearance). Andrea suggested I do the Bousta Beanie by Gudrun Johnson as my first Fair Isle project, and I accepted the challenge, with some trepidation. 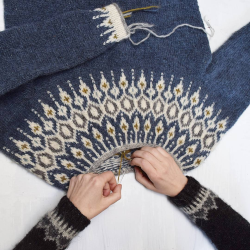 Gudrun is the 2017 Shetland Wool Week Patron, and you can get a free copy of the pattern by signing up for the Shetland Wool Week newsletter. As you can see I have made good progress and I can say it is a great project for making a start in Fair Isle. The 4-stitch repeat is easy to keep track of (… if you’re paying at least some attention…) and means that you don’t have to weave in your floats. I’m all for easing into things, so that is suiting me well. Andrea put me on to the two-handed Fair Isle method straight away, and we are both surprised at the success I have had. The tension of the left-hand thread is still shaky – sometimes tight, sometimes completely loose, but I think it will come with practice and a few tips from Andrea – when I have the concentration to take it on. Progress is quick, and I love the result, so it’s a very satisfying project. 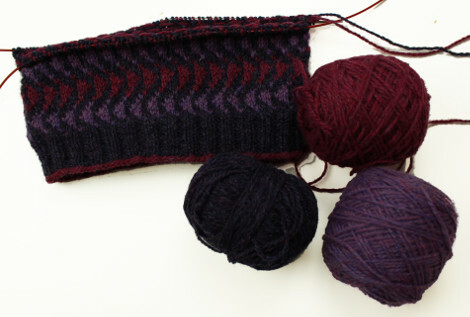 I’m using leftovers from the Firebirds jumper Andrea knitted a while back, which means I’m using the Hebridean 2-ply from Virtual Yarns. The recommended yarn is the Jamieson & Smith 2-ply Jumper Weight – go to The Woolly Thistle if you’re in the US. 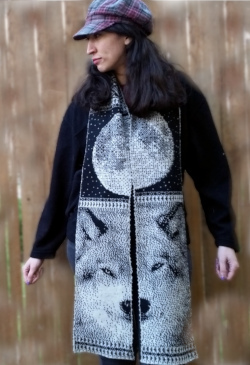 The pattern includes a few colorway suggestions, but the pattern will take to many combinations well. You can also find the Bousta Beanie on Ravelry. Remember to tag your hats on social media with #boustabeanie and #shetlandwoolweek2017 ! 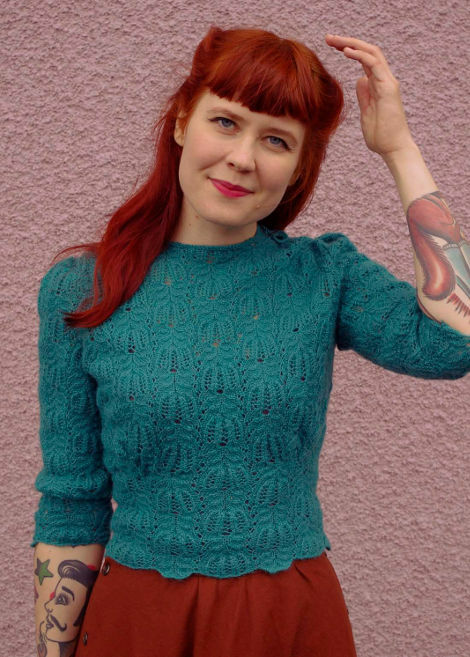 Madeleine had already finished knitting the back piece of this raglan style jumper which is knitted in pieces from the bottom up. She has just finished the front but was getting too absorbed in watching podcasts while knitting and knitted 20 extra rows. She now has a very long front and a shorter back. Either way there will have to be some cutting and grafting – sounds like serious surgery to me, but the girls are confident. The options are to cut the front, unravel and graft together or cut the back, knit 20 extra rows and graft together. She’ll think about it while knitting the sleeves. 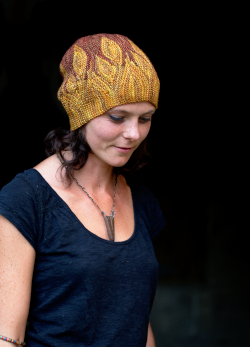 The pattern is Lantic, by Sarah Hatton, available in the Rowan Magazine 61, and the yarn is the Softyak by Rowan. 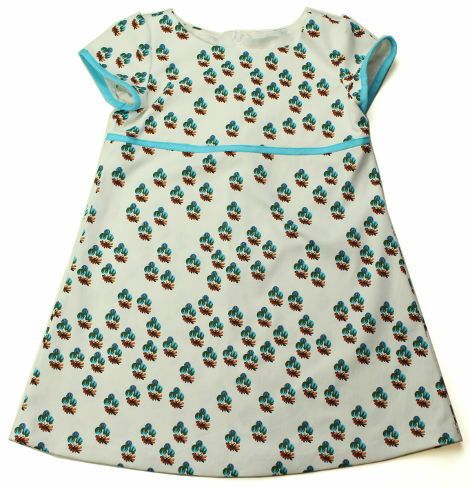 Two more matching dresses have been sewn, one for Andrea and one for her little 3 year old niece Simba. Andrea used the Very Easy Vogue V8993 (or sizes 16-24) for the second time, this time using the size 10 which meant she had less trouble with fitting issues. With the left over material a little dress with sleeves was made for Simba. Apart from the fun of planning a sewing project by picking out the pattern and choosing the fabric, the next most satisfying part for Andrea has been under-stitching the lining. It gives a crisp and professional finish to the garment and Andrea shows how she does it in a tutorial. Can’t wait to get to this episode! (I’m a little behind…) I took a class from Carson at Sock Summit ’09 and it was so informative. I still think about some of his observations and suggestions, even if I don’t always follow through with them. Hi Steven. Andrew here. I think the tricky bit is having the discipline before you know you need it… Have fun catching up! could you give me an idea where the link to asking you questions would be. I just discovered your Podcast a few days ago and still have a whole lot of episodes to look forward to, I come from the Rhein-Main-Gebiet of Germany (Odenwald), so I especially enjoy your hikes around my old Heimat. Thank you so much for the interview with Carson Demers! The knitting world really needs a book like this and as soon as I can get hold of it, I will purchase a copy. He has a very soothing and pleasant voice, too. Thanks for saying hi, Simone, and enjoy catching up! Hi Petra. Wir haben schon einige Anfragen bekommen und schauen, was da möglich ist. Schöne Grüße aus Offenbach. 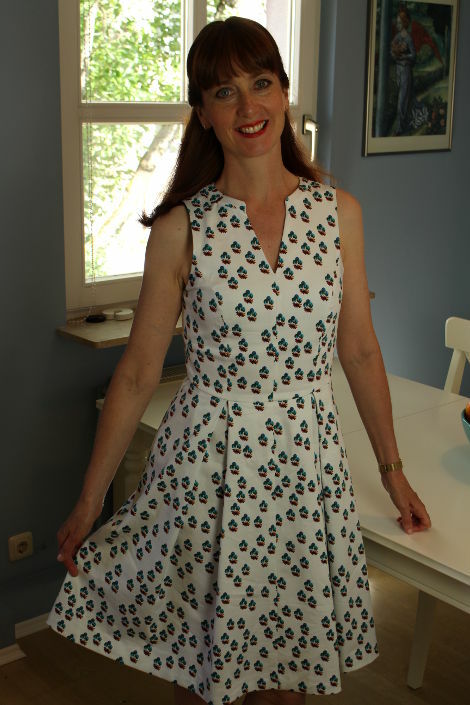 The dress Madeline is wearing in this episode is so cute! What is the pattern? Hi Barbara. You can find the details of the dress in Episode 30. Loved this episode…as I watch while practically in traction from a “pinched”? nerve in my neck. Possibly from a combo of Knitting on a plane/ jet lag/ head bobbing action… all I know is it’s been 2 days so maybe I need to see somebody. Oh did I say I can’t knit right now 🙁 Definitely going to get Carson’s book. Also loved the rest of the show… Andrew’s hat (one in my queue), Andrea’s dress (I also sew) and the guest knitte of vintage clothing. Thumbs up! One question: what is the sweater pattern Andrea is wearing today?